Back in late 2010 I had the idea to hike into Proxy Falls in Oregon’s Three Sisters Wilderness, to visit this amazing display of falling water in its winter glory. 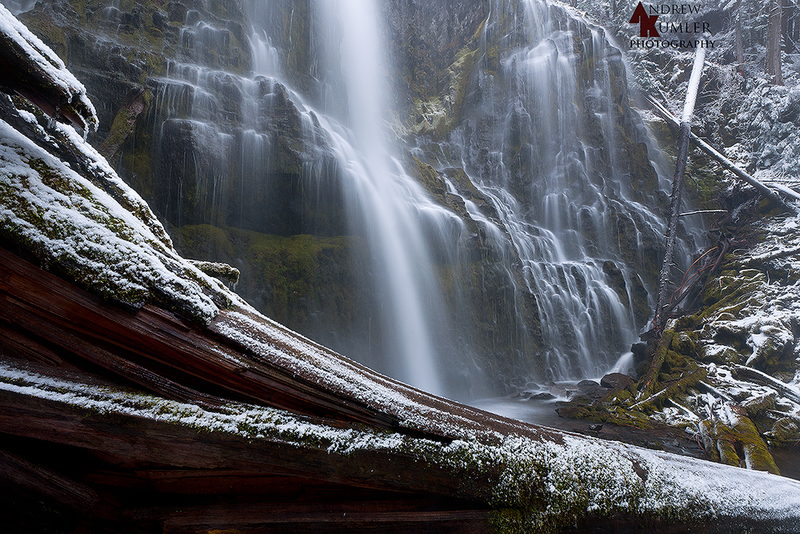 The Proxy Falls trail head is on Oregon Scenic HWY 242 and is gated off and closed during the winter months. This would mean I would have to park at the snow gate, and hike/snowshoe in the additional three miles or so to the marked trail head. I had been watching the snow level forecast for a few weeks trying to time the fresh snowfall with my time available to hike in. Finally one winter morning the conditions seemed right, so I headed up early from my home in Springfield, Oregon to give it a shot. I arrived at the snow gate just a little before sunrise to see just a dusting of new snow on the ground. Not being too worried though as I knew there would be a significant elevation gain over the next few miles of hiking. Put all my snow gear on and threw on my camera backpack. Then I sat there looking at my snowshoes wondering if I would even need them with such a small amount of snow on the ground. I decided to leave them in my truck thinking the snow couldn’t get that deep in just a few miles. The hike began quite uneventfully, walking through just an inch or two of fresh powder on the narrow and curvy Historic HWY. After the first mile or so the snow depth had increased to about 6 inches as I slowly gained elevation and hiked deeper into the Three Sisters Wilderness area. This trend continued as I hiked along, eventually nearing the trail head, trudging through several feet of snow. Now I am really regretting leaving the snow shoes in the truck, as I struggle to move forward as I’m buried to my waist with each step. After struggling for the last half mile or so I finally see the marked trail head. This is where the fun begins. The snow now is 3-4 feet deep and there are 5-10 foot drifts across the trail. This is an easy hike of only a mile or so in the summer, but with snow like this I can hardly make out where the trail even is. Stubbornly I continue on now, feeling blisters starting to form on my heels from pulling my legs up out of the deep snow for so long. Suddenly with my next step I quickly plummet into a snowy abyss. Apparently I had drifted off the trail and fallen into a pocket underneath some small trees. All I really knew was that I was now looking up about 15 feet out of a big hole in the snow. Tirelessly I try climbing up out of the pit that I am in. With each step only seeming to just move the snow around. Knowing I had to get out of this place on my own, I scrapped and climbed my way to the top, nearing exhaustion. So I finally make it back up on top of what I think is the trail. Even though I am less than a mile from my destination, I decide to call it quits and head back. The hike back to my truck was not too bad, besides the blisters on my heels seemingly growing larger with each step. Finally arriving back at the snow gate, I was so relieved to see my truck. I quickly got out of my sweat soaked clothes and began putting on the spare dry set I try to keep with me for occasions just like this. This was not the end though, I would not be defeated. 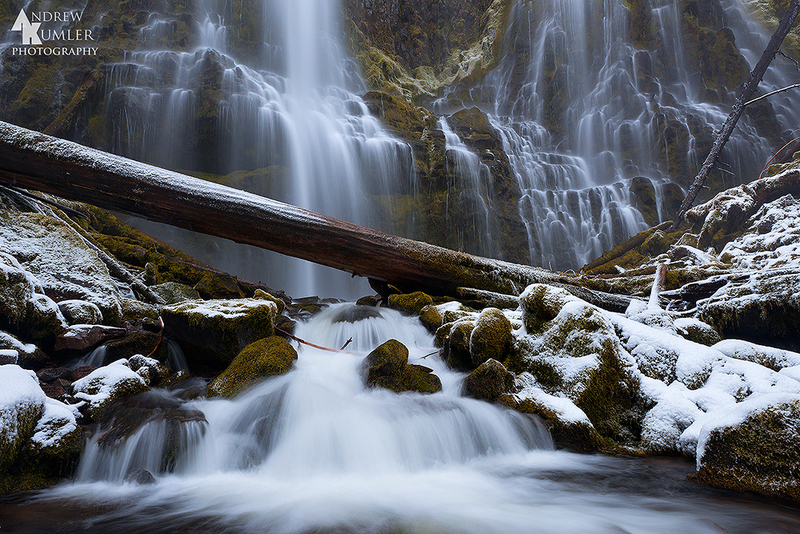 In summer 2011 I headed back up to Proxy Falls, this time with the snow gate open, and without any snow on the ground. Bringing my hand held GPS I had a new plan in store. My goal this trip was to map my path from the snow gate all the way to the base of the waterfall. Knowing then, come next winter I would have a bread crumb trail to follow. I started plotting my course from my truck at the snow gate, following the road to the trail head. Once there I continued tracking my course along the trail and down to the base of the falls. At this point, I saved the track and was now armed for the next winter’s snowfall. Of course, while I was here, I did take some photos of this amazing waterfall. 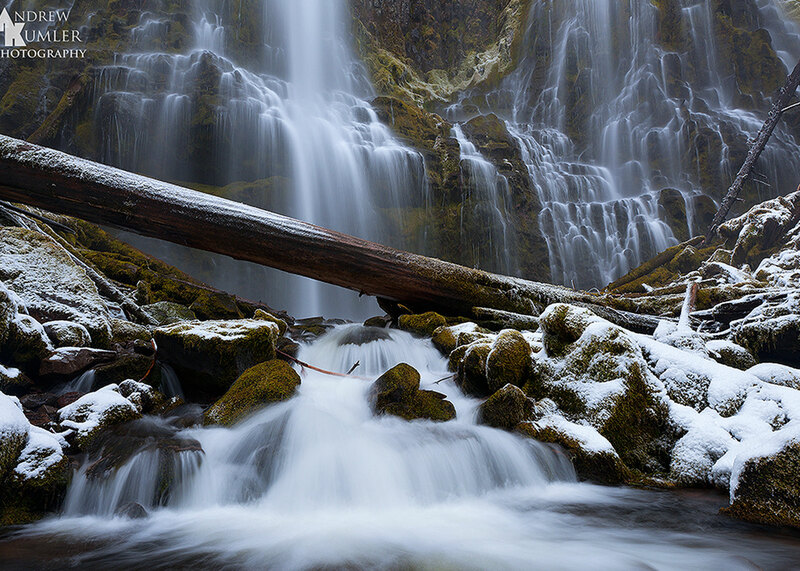 So finally in February of 2012, I get my chance again to make my way back to Proxy Falls in search of a snow covered waterfall. Gathering up my gear for the trip I made sure to grab my GPS unit and my snowshoes. No way was I not taking those this time. I left my house over an hour before sunrise to get to the snow gate. Upon arrival I am once again greeted by a few inches of fresh powder. Get my winter clothing out, snow shoes lashed to my pack and GPS in hand. I start my easy hike up the snow covered road making my way to the trail head. This trip though the snow does not get very deep along the way. By the time I reach the trail head I am walking through snow about a foot deep, just enough to make it tough with or without the snowshoes. At this time I start following the trail, guided by my GPS track I created last summer. 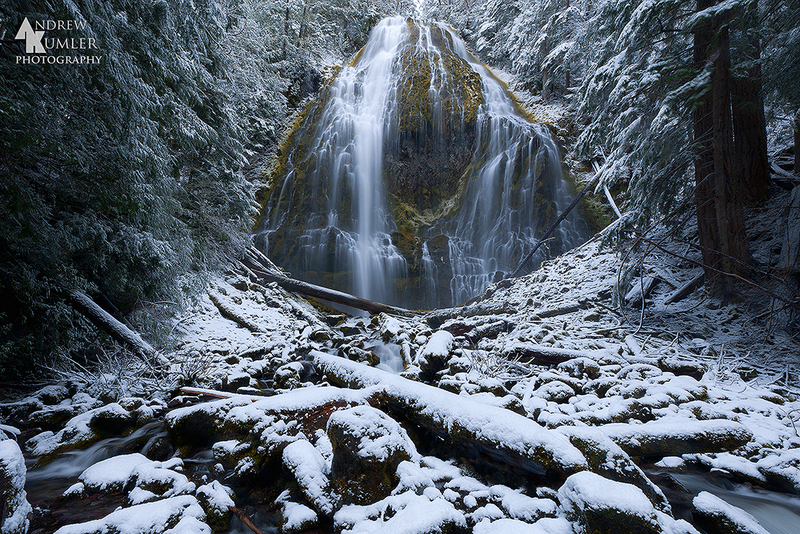 Following along perfectly I arrive at the top of the bluff overlooking the snowy delight of Proxy falls with its winter coat on. I stash the snowshoes and begin my scramble down the icy and slippery slope to the base of the falls. Once there I sit for a few minutes looking in awe as I get blasted by a cold biting spray. I grabbed a few different compositions, trying to get the most of my time in this winter wonderland. I was feeling overjoyed that this trip had finally become a reality after all of the time and setbacks I went through. I must have stayed there for about an hour, finally deciding to start heading my way back. It was a great trip and I feel I captured some unique and interesting photographs of a place seldom seen in these conditions. These images will most likely capture my heart more than anyone else, due to the efforts and planning involved to capture them. But I am proud to show them off, and grateful for the experience. Thanks for reading, and I hope you enjoyed the images as well as the story behind them. Congratulations Andy! Your images are exceptional examples of your passion and dedication to the art of photography and nature. More to come! The first wide angle is by far the standout. Beautifully graphic. Way to get it. Thank you so much for sharing your story and images. Once again, I see that some of the best images are the result of vision, persistence and sometimes forced planning. I love each of these images and commend your effort. I don’t know that I’ve seen images of this iconic waterfall in its “winter coat” before. Pretty sweet, Andrew. Since first seeing that wide angle image a while back, I’m positive that’s the nicest image of Proxy I’ve ever seen. Fun to hear the backstory. I really enjoyed reading about your journey, Andrew, and love the pics that you captured. They are breathtaking! I could relate to your story because I was climbing Mt. Lassen in July one year and was surprised to see so much snow still on the trail. So much that I lost the trail and was scrambling alongside the mountain not knowing where I was. It’s a miracle I did not slip and fall off the volcano and into an abyss such as you described, or just clearly off the side. It was dangerous, and I know how you felt. Thanks for the story and it was nice hearing you tell it. What a bunch of ******** this blog is.. None of your story is true.. Your lucky you got a few OK pictures because the rest of this story is ****.. Please keep comments civil and constructive. Personal attacks will not be tolerated. Unique images of a beautiful place. I’m thankful for your persistence.